Pet parents are looking at new ways to pamper whether it be grooming, products, food, treats, toys et al to pamper their canine baby. It is really awesome to hear people say/write…‘My baby’ to their canine family. But what happens when the real human baby arrives? Does the canine baby get neglected? Is the canine baby unhygienic then? Does the canine baby shed a lot of hair? Does the canine baby get jealous? Is the canine baby aggressive? Will the canine baby hurt my baby? So many questions arise and in some sad and worst cases…the poor canine is given up either to a shelter or relative or simply abandoned. 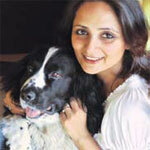 Why the canine who was loved, pampered and cherished – ignored now? The crux of the problem is not with the dog but with us the PARENTS. Once you get a canine puppy home he is yours for life and I would say vice versa too. When this remains your focus, questions as to re-homing/abandonment simply do not arise. We work our way around the situation and look for practical solutions. YOU – Your focus and intention (love for your dog) – do not ever waiver from the same. Keep your canine baby clean, groomed and brushed daily if the need be. Very important for the parents to divide responsibilities. Rest of the family also pitch in taking care of your furry angel. Do understand it is a big change for your four-legged too. Be patient – if required speak to a professional dog trainer. Don’t let him feel ignored- this would lead to jealousy and a not feel good factor for the baby. Always have both of them under supervision. Once your baby starts growing- crawling/walking – teach him to be gentle. Give your dog the space he wants and deserves. If something is disturbing him take him out of the room to another place and with a person he can be calm with. All this while do pamper your furry buddy with loads of love, treats, pats, praises because he is being very brave. Once you see both your babies playing together you will surely realise – THIS IS A BOND SO TRUE.